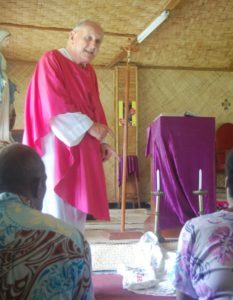 Fr Donal McIlraith writes from Fiji about the recent visit of the Columban Centenary Altar Cloth and the various difficulties he and Lay Missionary Marjorie Engcoy encountered in bringing it to remote parishes, where it was warmly welcomed in thanksgiving for one hundred years of Columban mission. Last year we were sent a strip of Irish linen. All Columbans and many of our parishioners signed it and sent it back to Ireland. 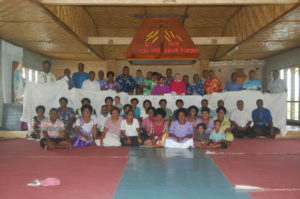 It returned to Fiji as the Centenary Altar Cloth. Our person designated to care for it is Marjorie Engcoy, our senior Lay Missionary. It was impounded for a week by customs and on Thursday 15 February, Marorie and I drove the four hours to Nadi to secure its release. We managed to rescue it, at a price. We headed for the Church of St Columban in Votua, part of Ba, one of our three parishes in Fiji. Fr Nilton Iman, associate priest and pastor of Ba was there to greet us, with a church full of people. 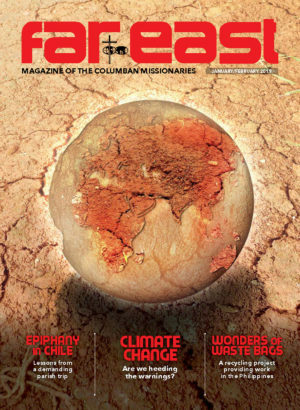 This included two former Lay Missionaries, Vaulina Sakula, who had worked in Chile, and Paulo Rabakewa who served in the Philippines. It was as if St Columban wanted us to begin here! During the Mass, celebrated on the altar cloth, I explained that the cloth is a call to prayer for the Society and its mission in this Centenary Year, a call to adoration, to thanksgiving for our hundred years of mission, to repentance and to asking for the future, especially that the Lord of the Harvest, send workers into his harvest. The Eucharist here in Votua seemed to all to be a moment of intense awareness of the Risen Christ. The next day was more adventurous. Fr Nilton drove us to Navala, a traditional Catholic village in the mountains over Ba. We got to the bridge just outside the village at 9.30am. A raging torrent kept us from driving over it. The villagers really wanted Mass and to celebrate the Columban Centenary with us so they sent their water taxi to bring us over. Within an hour of our arrival, a delegation of young men arrived from the village – on tubes – and invited us to jump aboard. 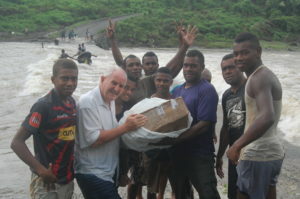 I had been parish priest here during the great floods of 2012 and I knew that these young men knew their river well and that we would be quite safe. So, I offered to go first. 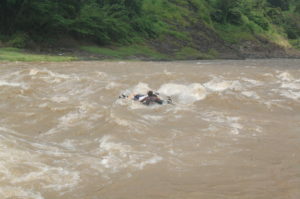 The first few minutes were a bit scary as we made our way through turbulent waters but they knew their stuff, and in no time at all I was at the village side encouraging the others to follow. All crossed, wet but safely. They then brought the altar cloth over without a single drop on it. It was quite a shock for poor Marjorie. She had no idea that caring for the cloth would involve tubing across rivers. Nor did I. Almost the whole village turned out for the Eucharist and once more mobbed the altar cloth after Mass. 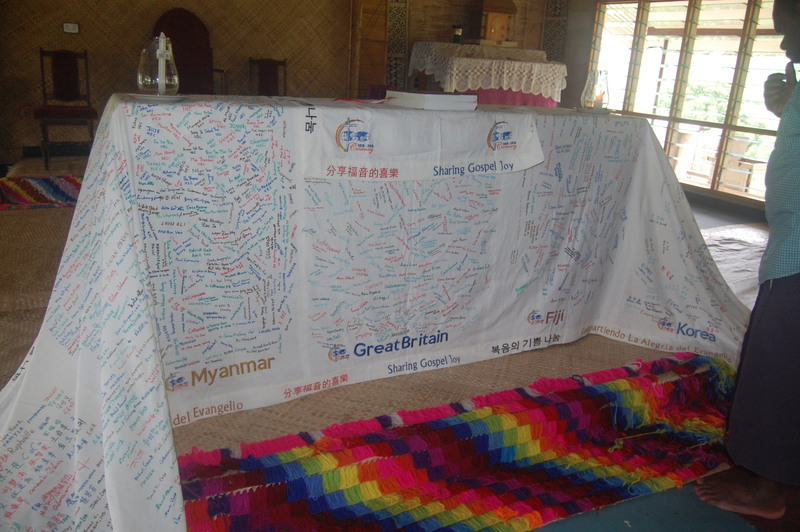 The cloth presents all the countries where Fiji Columbans worked or studied. Indeed, Ioane Naio is a seminarian from just down the road, whom they know very well and who studies in Manila. Today, I focused on the call of the cloth to faith as well as prayer. We Columbans and our people need to thank God for our Catholic faith and to hand it on carefully. As we left, Silivia, a villager walked with me and reminisced on the Columbans who had served them over the years, Fr Charlie O’Mahony at the start, then Frs Doyle, Keelan, Batchelor, Rouse (who played rugby with them), McEvoy, Rathbun, Tierney and many others. 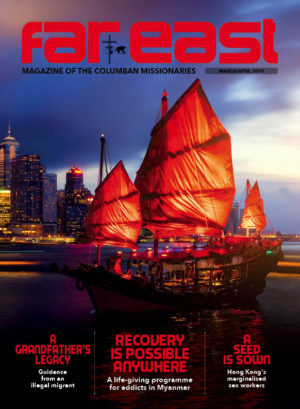 The Columbans have served Navala for two thirds of or existence, sixty-six years. Tubing back was child’s play and so we returned to Ba town with a few other minor flood adventures sorted out by Ila, a Fijian who helped on the journey. The altar cloth was out again for the parish mass at seven that night and similar scenes of enthusiasm were evident. The cloth will continue to visit villages in all three Columban parishes and invite them to celebrate our Centenary. We will also celebrate in Corpus Christi teacher’s training college where many of us taught, in the Pacific Regional Seminary and in Suva Cathedral. The call to prayer, to mission and to faith are parts of the call of this Centenary Cloth. We hope to have a prayerful month while it is with us.